Organic Castor Seed Oil (Ricinus Communis) - Sweetgrass&Rain Inc.
Castor Seed Oil is extracted from the Ricinus Communis seed or castor bean, which, despite its name, is not a true bean. 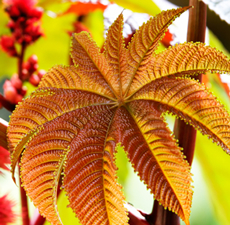 Castor is indigenous to the Mediterranean, East Africa and India and is widespread throughout tropical regions. The seeds contain between 40% and 60% oil that is rich in triglycerides, mainly ricinolein.The seeds also contains ricin, a water soluble toxin, which is also present in lower concentrations throughout the plant and is not extracted with the oil. Castor Seed Oil can act as a protective barrier on your skin and is popular as a conditioning agent in used in soap-making and skin-care products.